This cake may not look like much, but it’s one of the best cakes ever. 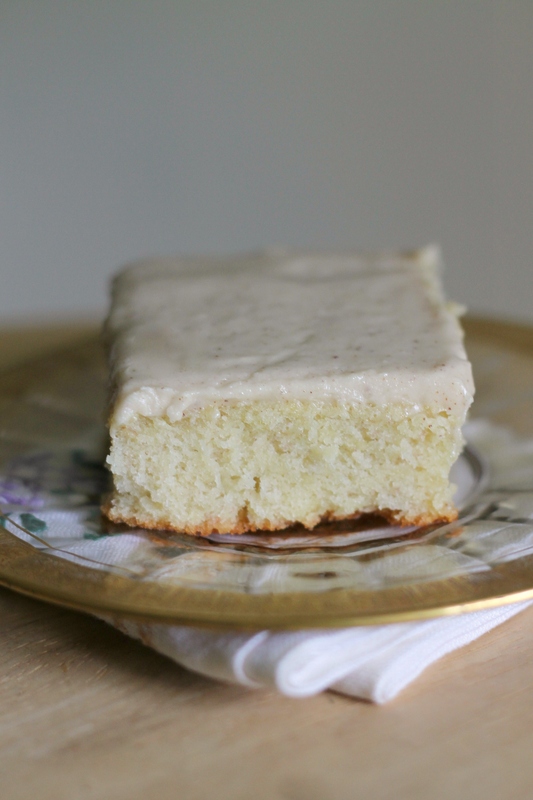 We’ve been making this banana cake for a while, and usually top it with cream cheese or chocolate frosting, but this time, we made a quick brown butter frosting and it was amazing! (Side note: I just realized we’ve never topped it with peanut butter frosting. That needs to happen soon!) The cake is moist but it is never gummy, like some banana cakes can be, and the batter can be made in less than 10 minutes. The frosting is quite simple too- brown some butter, stir in powdered sugar, milk, and a bit of vanilla, and it’s ready! We were a bit hasty and frosted the cake while it was still slightly warm, so our frosting melted a bit, making it flat and ugly for the picture (sorry everyone- next time we make this cake, we’ll update the photo, so stay tuned! ), but it tasted heavenly. Brown butter and banana seem to be a natural combination, just like peanut butter and chocolate. We hope you’ll try this cake sometime soon. It is one of our favorites, which is saying quite a bit since we have made a lot of really good cakes! Preheat oven to 350 degrees. Grease and flour a 9×13 in. pan. Set aside. Stir together the flour, baking soda, baking powder, and salt. In a large bowl, beat together butter and sugar until fluffy. Beat in the eggs and vanilla, then the banana. Alternate adding the flour mixture and buttermilk, starting and ending with flour. Pour batter into prepared pan and bake for 45-50 minutes, or until a toothpick inserted into the center of the cake comes our clean. Cool in pan for 10 minutes; remove cake from pan and let cool fully on a wire rack (or, if you are in a low-maintenance kind of mood, like we usually are, you can keep the cake in the pan and just frost it in there for easy transportation). Brown the butter in a skillet. Let cool. Stir in the powdered sugar, vanilla, and pinch of salt. Stir in milk 1 teaspoon at a time until frosting is thick and spreadable. Frost the cooled cake the the frosting. Cut into slices and serve. Enjoy! The frosting sounds interesting, something I may have to try. Looks great!